By pushing migrants back to Libya, Italy violated the European Convention on Human Rights, in particular the principle of non refoulement, which prohibits returning migrants to countries where they may face persecution or inhuman or degrading treatment, the European Court of Human ruled this morning. The case Hirsi and others versus Italy, was about Somalian and Eritrean migrants travelling from Libya who were intercepted at sea by the Italian authorities and sent back to Libya on May 6, 2009. The Italian Authorities intercepted a boat carrying about 200 Somalis and Eritreans, including children and pregnant women. These migrants were taken on board of Italian ships, pushed back to Tripoli and handed over to the Libyan authorities against their will. They were not identified, heard or informed of their real destination. 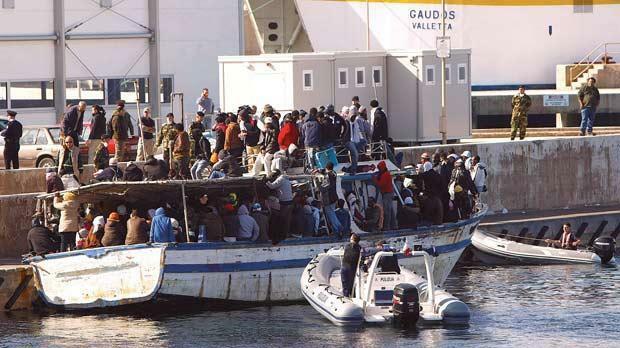 11 Somalis and 13 Eritrean, traced and assisted by the Italian Council for Refugees (CIR) in Libya after their refoulement, lodged a complaint against Italy to the ECHR. The Court this morning fully condemned Italy for violation of three fundamental principles - No one shall be subjected to torture or to inhuman or degrading treatment or punishment; the right to an effective remedy; and the prohibition of collective expulsions. It said that the rights of African migrants in transit to reach Europe were systematically violated in Libya. Furthermore, Libya had not offered asylum seekers an adequate protection against the risk of being returned to their countries of origin where they could be persecuted or killed. Under this policy, more than 1,000 migrants, including pregnant women and children, were intercepted by the Italian coast guard and forcibly returned to Libya without an assessment of their need for protection, according to the UNHCR. The Unione Forense per la Tutela dei Diritti Umani, the CIR and the European Council on Refugees and Exiles welcome the judgment. The Italian government’s argument that Libya had to be considered as a “safe country” and that applicants had not expressed - in any way - their wish to apply for asylum or any other form of international protection, was rejected by the court. The UN Refugee Agency welcomed the European Court's decision. "The judgment provides important guidance to European states in their border control and interception practices, representing a turning point regarding state responsibilities and the management of mixed migration flows," the UNHCR said. It said that as an intervener in the case, UNHCR highlighted the obligation of states not to forcibly return people to countries where they face persecution or serious harm. This is known as the 'non-refoulement principle'. "In its submission to the Court, UNHCR underlined that given the situation prevailing in Libya at that time, pushback policies undermined access to protection and the principle of 'nonrefoulement', which also applies on the high seas. "UNHCR appreciates the challenges that irregular migration poses to Italy and other EU countries and acknowledges the significant efforts made by Italy and other states to save lives in their search and rescue operations. therefore unable to declare their intention to apply for asylum immediately after their interception at sea. "UNHCR recommends that border control measures should provide for access to the territory of persons in need of international protection."